One thing that I was recently saying that I missed from the old forums was the sidebar that shows all the currently active topics. While not in sidebar form, I recently found the little "View active topics" link that is a passable substitute for now. I know it's sitting right out there in plain sight, but if I missed it, I thought *maybe* someone else was silly like me and missed it at first also. I've updated my bookmarks to point to that page now to be my personal gateway page for the site. Last edited by CDNAdmin on Mon Dec 17, 2007 9:10 am, edited 1 time in total. Check out phpbbhacks.com for a lot of cool things you can add into the system. One of which you should seriously consider is the auto-question option to help avoid a bunch of spambots signing up. - Make sure to back everything up first! - Make sure you only install hacks that are associated to your current build. - Make sure to keep a list of all the items that you install because when you upgrade to new builds you'll have to redo a lot of hack-inserts. - Don't do too many hacks...be picky. Sometimes the hacks aren't updated along with releases and then you're stuck losing functionality. 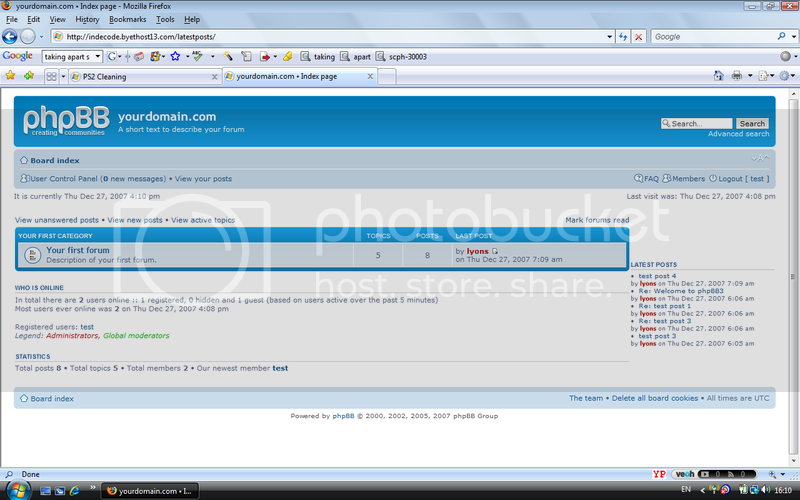 I've already started looking at phpbb plugin development to make a new version of the new post notifier. Thanks for the active topic link clint! Have you seen the Ego Search. These are all the topics you have posted in. very cool. Thought I would mention that the bar that is near the top of the page with your location in the board and the various view posts links does not show up when you are looking at the board index. (I know the one at the bottom is still there). this kinda throws off the consistent layout of the forums and makes it harder to find the view topics links on the index page when you kinda expect that bar to be at the top from looking at all the other pages. I was referring to this forum, sorry if I caused some confusion. Looks sweet, Lyons! Thanks for trying this one out! If it could work for anon users, this would be perfect for the forums here!